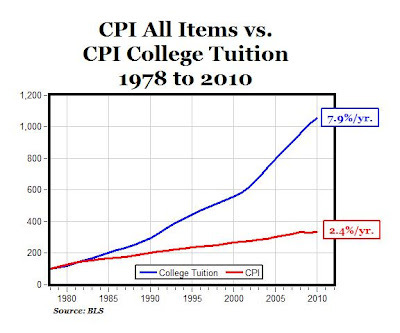 Reason #1: Tuition has been increasing at double triple the rate of inflation. "On average, college tuition has increased at around 8 percent per year, which means the cost of college doubles every nine years. Because colleges know that students will simply borrow more money to cover tuition increases, colleges have been relying on steady tuition hikes to solve all of their money problems. If this continues a college degree will soon cost as much as a house." MP: Actually, tuition has been been increasing annually (7.88%) at more than three times the rate of inflation (2.37%) since 1978, see chart above. The article points out that "unlike the housing bubble, in which foreclosure and bankruptcy allowed people to have a fresh start, the college tuition bubble will haunt young people for life unless bankruptcy laws change" (since student loans are not dischargeable in bankruptcy). Quite amazing the amount of money college costs today. The Ohio governor was able to get state institutions to freeze their tuition for 3 years but now they are all rising at 6-8% again. More amazingly is that what used to be 4-year curricula are now 5 years. That's a 25% increase right there. Unlike manufactured products that come with a warranty or refund if the product does not perform, there is no warranty or refund if the education fails to result in employment or employment with income above that which could have be obtained with less education. Education has certain aspects of religion: a belief that it is essential to personal improvement, a willingness to sacrifice for the dedication to it, and continued belief in it even if it doesn't deliver what is promised. When the cost of that belief becomes too high, adherence to that belief will diminish. How exactly would this bubble burst and what happens then? Would tuition, like housing, begin a rapid downward spiral? At what point does tuition then level off? I'm thinking that alternatives to traditional education would compete directly in cost and in results with colleges and universities. Traditional education is clearly an obsolescent artifact of our society and as such, should gradually fade. As state funding has decreased, tuition has increased. The other facts that jump out are the massive increase in the overall budget (almost seven times), and the massive increase in Federal funding (especially when you figure that much of the tuition funding is probably Federally funded student financial aid). geoih -- it would be much more interesting to see how the spending (versus revenue) has evolved over time. Why the 3 times CPI increase? Also, the source article's bandwidth limit has been exceeded. college degree will soon cost as much as a house." Add in the alumni contributions to the endowment and what chew got? More than a house -- right? Do college entrance committees run on regular or do they burn endowment contributions? Were you selected for admission on the basis of your family's ability plus your future ability to contribute? But why do we send our brightest child to the military but send our clumsiest kid to college? To get her/him married into a safe family, married to a safe student who will someday be able to contribute to the alumni fund. Couldnt agree more with Anonymous @ 6/9/2010 4:39 PM. The reason tuition goes up is that once profs are tenured they can stop teaching/research and live in a comfy suburban home drawing a meaty paycheck. Their research is arcane/mathematically elegant and satisfying with little to no applicability for working class folks or any synergetic with teaching. They need to be jolted from their ivy league towers.